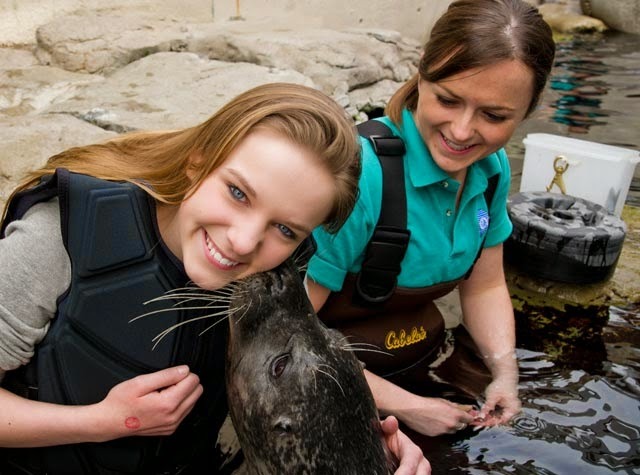 Every spring our interactive program with the seals switches over from the winter program to an even more immersive activity called Take a Dip with the Marine Mammals. 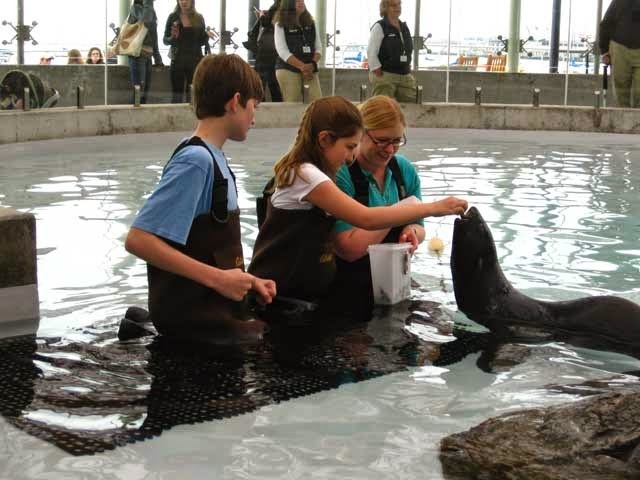 This popular program gives you a behind-the-scenes look at the marine mammal exhibits—either the harbor seal exhibit on the front plaza or the marine mammal center overlooking Boston Harbor with fur seals and sea lions—and lets you get in the water with the animals! Billy Hoysgaard shared his video with us and we thought it would be a fantastic way to impress on our blog readers just how close you can get to the animals with this fantastic Aquarium experience! Here's his first-hand perspective. As Billy experienced, visitors slide down to sit in the water and work side by side with a trainer. While the actual activities each visitor will do varies depending on the animal that day, participants will likely be able to feed, rub an animal's fur, deliver hand signals and maybe even get a kiss. "I learned so much from the trainer Erin, and Lana the seal," Billy said. "Erin was really welcoming, warm, informative and knowledgable. Whether Lana was doing twirls or giving kisses, she was so well behaved...and beautiful! I loved feeding her, and working on a new 'hand holding' skill that Erin was teaching Lana." These programs make great gifts for any animal lover—like Billy. "My girlfriend surprised me for my 32nd birthday with Take a Dip with Lana. She learned about it from a friend who had also done the Take a Dip program," Billy explained. "What made it even more special is once we arrived at the Aquarium, we learned that just days before, it was also Lana's 32nd birthday!" These programs are also a great opportunity to expand your knowledge of the Aquarium as well as marine mammals in the wild. Reservations are required for these special programs. Call 617-973-5206 to book your Take a Dip program to find out what the animals eat, discover their unique personalities, favorite toys and each seal's special skills. And you'll walk away with new appreciation for these amazing marine mammals and wonderful memories of a truly unique experience.